Ken’s wife, Wendy Denton, didn’t understand at first. But she quickly learned the question is a common one when people aren’t sure what else to say about cancer — a way of asking how serious the diagnosis is. (Stage 1, Stage 2, etc.). 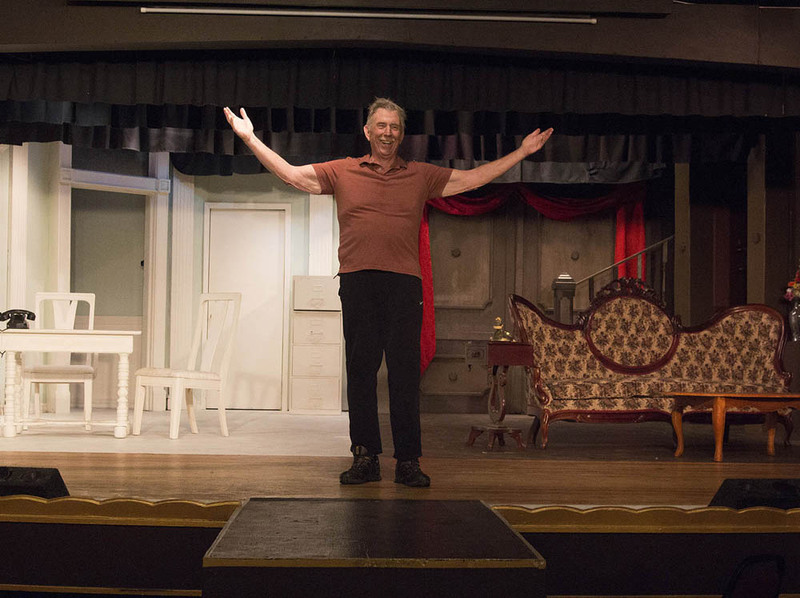 Which is why the pair set up a photograph they titled “Have They Staged It Yet.” It portrays West, a community theater veteran, at Golden Chain Theatre in Oakhurst. With a backdrop of what looks like a drawing-room comedy, he stands with a smile on his face, arms raised high, looking as if he’s receiving rapturous applause after a one-man show. Don’t expect the expected in Denton’s remarkable photo series “Cancer Chronicles,” in which she followed her husband’s 18-month journey from diagnosis to his death at age 67 in December. The exhibition, on display at the Chris Sorensen Studio, includes gripping and poignant images as West faced his illness, to be sure. But it also brims with a broad and joyous sense of humor, reflecting the personalities of the Oakhurst couple. They decided after West’s diagnosis that they were in this journey together. We caught up with Denton, a longtime photographer, to talk about the life-changing experience of putting together the show. Question: The first photo in your exhibit is of Ken receiving his diagnosis of pancreatic cancer. Tell us about that day. Did the two of you decide then you would be doing this project together? Answer: Ken had already had a procedure a week or so before that revealed the cancer was showing up as a few spots in his liver. When we went to Dr. Brandy Box-Noriega, the oncologist at Kaiser, we learned what that really meant. Dr. Box-Noriega outlined treatment protocol and discussed do not resuscitate directives, names of chemotherapy drugs, etc. We listened as carefully as we could, but I could see Ken’s eyes glaze over now and then. Later he talked about the random thoughts he had had during Dr. Box-Noriega’s explanation. On the drive home, we talked about how we could best handle this life-altering process. I think it was Ken who suggested we document the entire process. Tell us about Ken as an artist and as a person. Ken was generous, kind, took in all the animals I brought home, supportive, incredibly bright and insightful. He was outspoken, sometimes combative, especially in the face of injustice. He meditated regularly, had years of post-Vietnam therapy, was funny and wise. Ken had tremendous courage in the face of hard truth. Ken started taking pictures in the seventh grade and was attracted not only to the art of seeing and capturing moments but to the mechanical gadgetry offered by the camera. He loved taking pictures of wildlife, mainly birds, and anything that challenged his skill, patience and equipment. For him, photography was a way of being in meditation with the moment, aware of possibilities and potential. How often did you make photos for the project? Once we locked onto the project, we talked about it all the time. For the entire 18 months, we played with image ideas, experimented with locations and made many more images than are in the exhibit. We didn’t really have a routine. We got an idea and just did it. Coming up with ideas was exciting and fun. I would wake up with fully formed image ideas and sometimes even dream them. Because Ken had a rich background in philosophy, and I had studied cultures and religions, we both had rich visual traditions to weave into our images. For example, “St. Sebastian on Chemo” blends the image of an early Christian martyr and the experience of chemotherapy. I love the image of him I made the day before he died. The beautiful planes of his face, the peacefulness in his stillness. He was without fear, and he was without pain. What did this photo project mean to you and Ken? This project brought us closer than we had ever been in our relationship. We were completely transparent and intimate with one another. This process facilitated a degree of healing we could not have anticipated. There were no secrets, hidden thoughts, things left unsaid. What I had also not anticipated was the way I released all resentments. OK, he left the toilet seat up and his clothes on the floor. None of it mattered anymore. In an instant. None of it mattered (and actually never had). Instead, we talked about Janus, the god who could look at the past and the future at the same time and how could we show that in an image. We talked about my self-portrait of my face in a shattered mirror and my initial feeling of being disconnected, displaced. Most of all, this photo series made it impossible to hide or avoid. It encouraged us to look at each other clearly and with honesty. Does the humor in the show reflect Ken’s nature, or yours, or both of you? Oh, this humor belongs to both of us. Ken and I frequently amused each other with our irreverence and disregard for convention. We joked about things that a lot of people wouldn’t even talk about, let alone with irreverence. For example, the last image in the series is of the cremation container that I covered with our photos, sitting in front of the fire extinguisher. If Ken could have seen that, he would still be laughing. The reporter can be reached at (559) 441-6373, dmunro@fresnobee.com or @donaldbeearts on Twitter. Read his blog at www.fresnobeehive.com.